It's official: Fujifilm has confirmed that the much-anticipated, heavily leaked X-H1 model will arrive in just a few weeks' time. The X-H1 has been rumoured for months, although Fujifilm has only officially announced the model this morning. Positioned above the current co-flagship X-Pro2 and X-T2 duo, the model is to be "the highest performance camera in the X Series range of mirrorless cameras," according to the firm. The new model becomes the first X-series camera to offer body-based image stabilisation, a feature that has only previously been offered inside a number of the company's lenses. This makes use of three axial accelerometers, three axial gyro sensors and a specially developed dual-processor, which work together to perform approximately 10,000 calculations per second. The system works with all of Fujifilm's XF and XC lenses, and is claimed to have a maximum compensatory effect of 5.5EV stops. Elsewhere, the camera uses the same 24.3MP X-Trans CMOS III APS-C sensor and X-Processor Pro that were previously offered inside the company's X-T2 and X-Pro2 models. The body itself is made from a 25% thicker magnesium alloy than the X-T2, and has been weather-sealed for protection against the elements. The familiar combination of a high-resolution EVF and a tilting LCD can be found around the back of the camera. 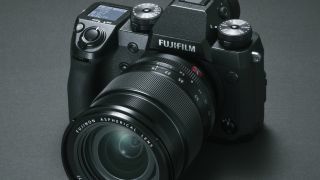 Fujifilm has fitted the new camera with a 3.69million-dot EVF that has a 0.75x magnification (in 35mm terms) and a 100fps refresh rate, while the 3in tilting LCD screen has a 1.04million-dot panel and responds to touch control. In a move that mirrors the design of the medium-format GFX 50S, this LCD is complemented by a further LCD panel on the top-plate, which displays key shooting and exposure information. This is the first time such a panel has been incorporated on an X-series camera. As for its video-recording capabilities, the X-H1 records footage in both DCI 4K and UHD 4K options, to a maximum 24p and 30p respectively, with a further Full HD option alongside. Fujifilm's previously seen F-Log feature is present, and this is complemented by a new Eterna Film Simulation feature. This, according to Fujifilm, simulates cinematic film by recording understated colours and rich shadow tones. A variety of further tweaks to Fujifilm's existing video toolbox include a 120p recording option in Full HD, which can be output at 1/2, 1/4 and 1/5 speed to create slow-motion results, together with 200Mbps high-bit-rate recording and verbal time codes. Other features include Flicker detection, an increasingly common feature designed to maintain consistency when capturing under artificial lighting sources, together with both Wi-Fi and Bluetooth. The model will also be compatible with a new VPB-XH1 Vertical Power Booster. In addition to boosting battery life and making portrait-orientation-shooting easier, this also increases the maximum burst rate of the mechanical shutter to 11fps, and also features a headphone port for audio monitoring while recording video. The X-H1 will be available from March, priced at £1699 for its body only in the UK. A further option, which sees the body bundled with the Vertical Battery Grip will be made available at £1949. We'll update this page with pricing for other territories once we have it.